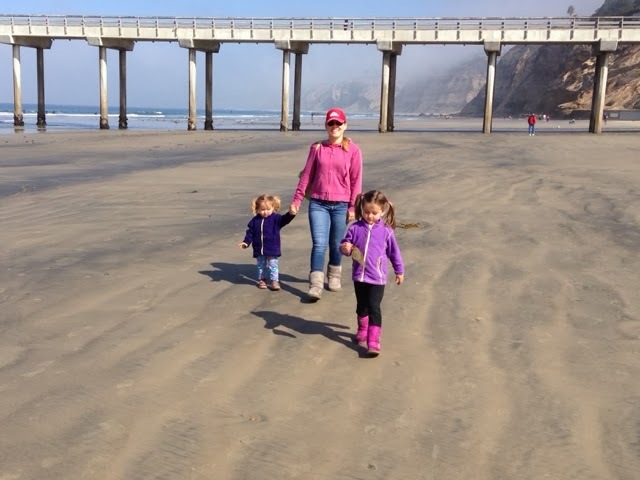 It was another beautiful day in paradise here today, and it being Sunday it was another day to spend with the girls. 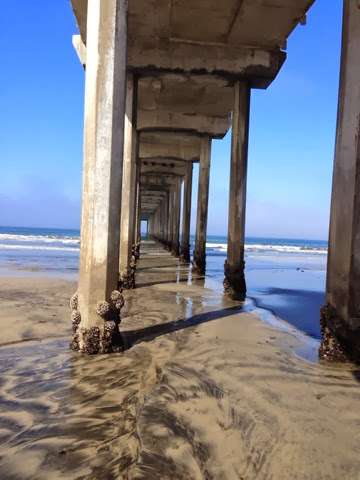 We were up early and out of the house to La Jolla Shores for a walk. 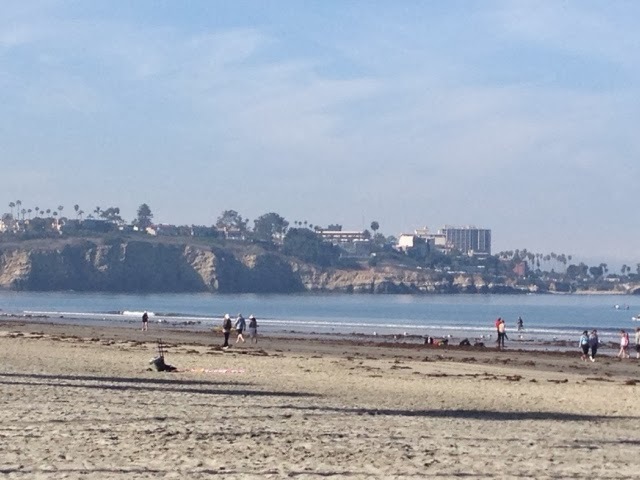 Here is a picture looking south to downtown La Jolla. 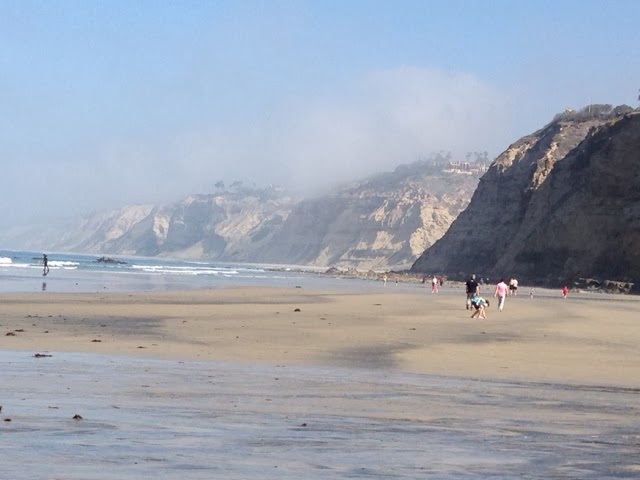 At this end of La Jolla Shores is La Jolla Cove and where Denise & I have taken a kyak tour of the caves on the sharp cliffs rising up from the water surface. The area is popular for seals & at time some kind of sharks that just basque in the water. Before our walk it was time to use the playground. 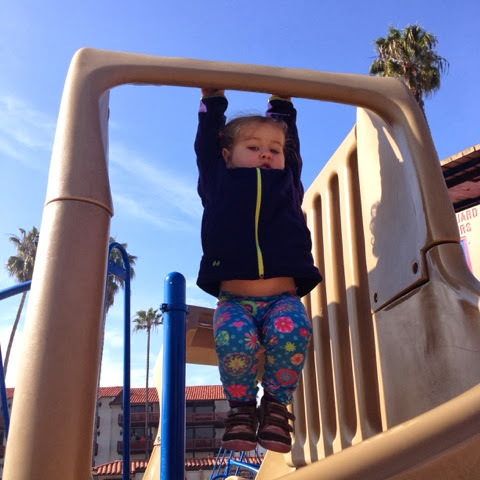 Madison at 5 is still practicing the monkey bars. Future gymnist possibly? Taylor at 2 just hanging around. This area is also popular to scuba diving. 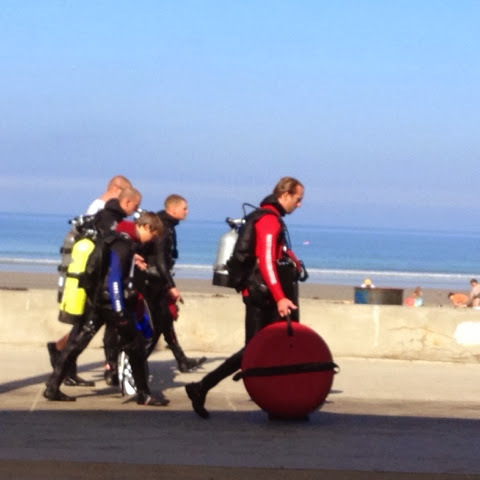 There were many groups diving and yet other groups were surfing. 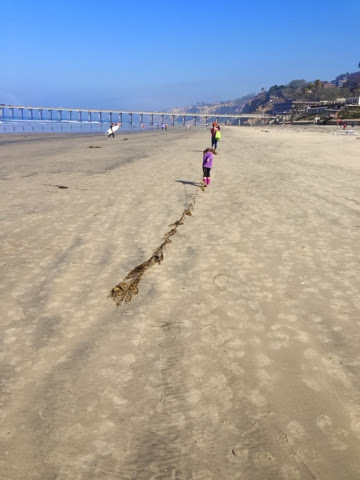 Now on our walk Madison finds some seaweed and drags it for some distance. 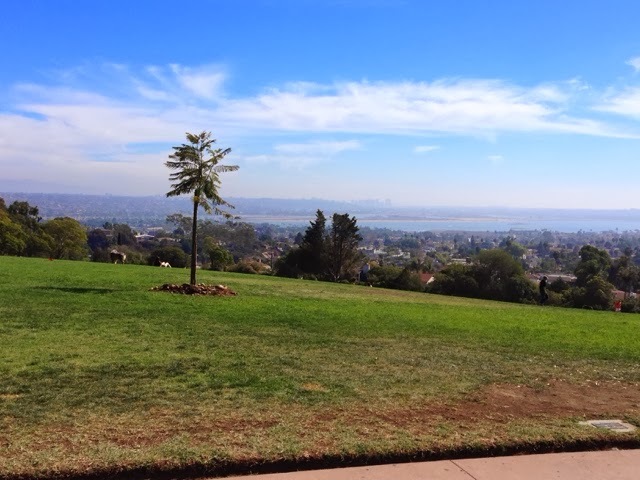 Looking north to Torrey Pines. Heading home after our walk. 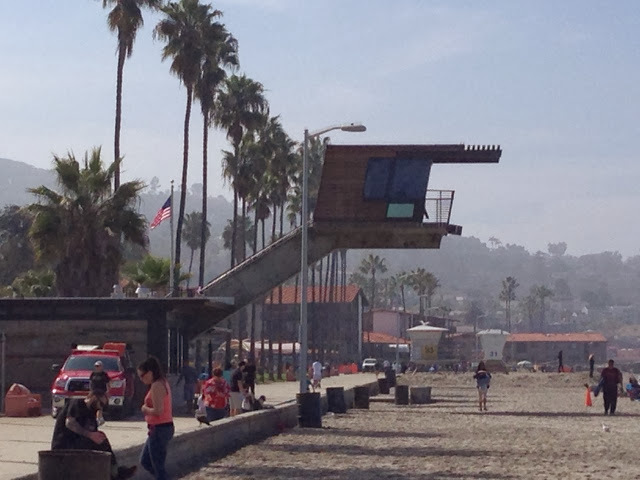 Here is the new lifeguard lookout that has seen a lot of negative press lately. 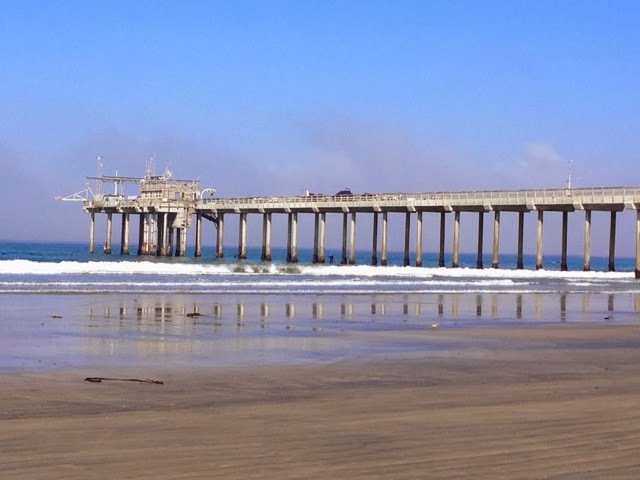 It seems that there is a viewing problem that only showed up this winter when the sun went low in the sky causing a reflection (glare) on the glass windows that makes it extremely difficult to see swimmers. Here is a link to the detail story on the lifeguard station problem. After returning to the house from our walk I wanted to go out for a bike ride and work on biking this mountain. There are 5 roads up Mt. Soledad. I chose a different road with a more gradual overall slope. I road down to Kate O Sessions Park. This location did not have as much vertical height change as the other way and was 5.5 miles round trip. I still have more work to do to get my skills up to make the hill up from La Jolla downtown. Weather reports are indicating much needed rain possible for southern CA later in the week. I plan on some indoor and outdoor activities to match the weather during my final week here.